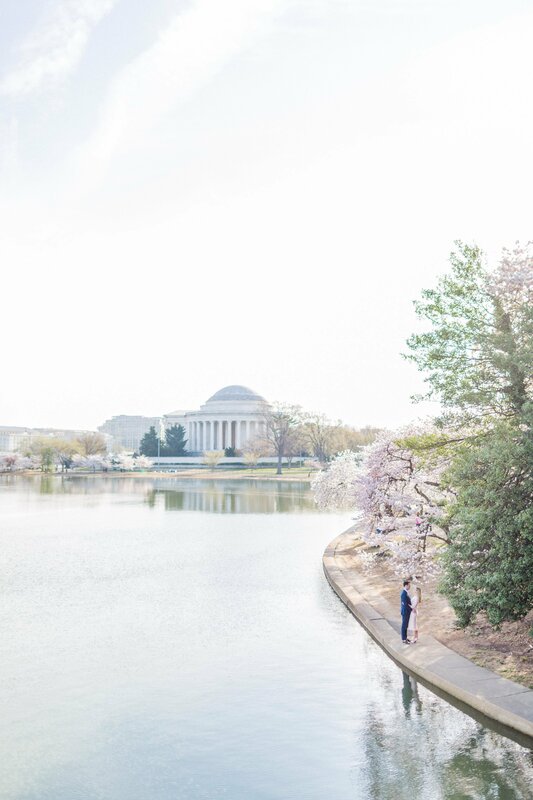 Every spring, people light up DC-area photographers like Kir Tuben (website/Instagram) and Lisa Boggs (website/Instagram) with requests for a very specific photo: Themselves, celebrating their decision to get married amid the Tidal Basin’s famous cherry blossom trees. That’s a lot harder to pull off than it may sound: The trees bloom when they’re ready to bloom, and they are one of this regions’s most heavily visited tourist attractions. So finding an uninterrupted pink backdrop for your love isn’t that simple. The National Park Service typically issues its peak bloom prediction in early March. The earliest peak bloom was March 15, 1990; the latest was April 18, 1958. And sometimes, like last year, bad weather can affect how long they’re around. “The flexible bird gets the worm,” says Tuben, who tries to fit in “mini-sessions” on Saturdays for couples who for whatever reason can’t make a sunrise session during the week. “When you sign a contract, you do have to have this caveat that this is the date but this may change,” says Boggs. “Most of the time it ends up working out.” Both photographers encourage couples to secure permits in advance from the Park Service (the permit requirement “sometimes gets enforced,” Tuben warns), which costs $140 for two people. The best light is at sunrise: “Golden hour,” both Tuben and Boggs say. “I personally like the way the sun comes up over the Tidal Basin,” says Boggs, who wakes at 5 AM during cherry blossom season to prep for sessions that typically last from 6:30 (around the time of sunrise) until 8:30 AM on weekdays, which usually leaves clients enough time to prepare for work. Weekdays are less busy, even though both photographers say you see a fair number of people out around sunrise. That includes not only other professional photographers—both Tuben and Boggs say they run into colleagues every single time they’re out—but also hobbyists and, because this is DC, joggers and cyclists. Good photographers are directed by their clients’ wishes, but both Tuben and Boggs have go-to spots that they suggest. Tuben likes the areas around the MLK Memorial and the FDR Memorial, which tend to be less busy around sunrise. For Boggs, who says she thrives on challenges like suggesting intimacy in a wildly popular public space, it’s also “all about the angles,” i.e., moving around the subjects to eliminate background distractions. Neither Tuben nor Boggs say they’ve seen anyone fall into the Tidal Basin, but Tuben had one client who put a bag down to be photographed, and guess where it wasn’t a few minutes later? “I’ve seen everything from quinceañeras to, this morning, there was a team of five people” taking photographs, she says. “With the advent of Instagram, people get into it. You see really elaborate selfie setups. A dog wedding.” Have fun, both advise—you can embrace the unexpected as tightly as you embrace each other.